FILE - U.S. Rear Adm. Kevin Sweeney is pictured in January 2014 aboard a French aircraft carrier in the Gulf of Oman, during joint U.S.-French operations. Rear Adm. Kevin Sweeney, chief of staff to the secretary of defense, has resigned, according to a Department of Defense statement released Saturday. Sweeney had held the position since January 2017. "After two years in the Pentagon, I've decided the time is right to return to the private sector. It has been an honor to serve again alongside the men and women of the Department of Defense," Sweeney said in a statement. His resignation was the latest of several from the Defense Department. Secretary of Defense James Mattis, for whom Sweeney had served, announced his resignation in December and left his post earlier this month. 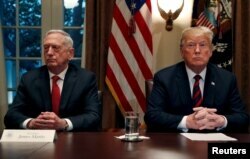 Mattis announced his resignation in late December, shortly after President Donald Trump said the U.S. would be pulling out about 2,000 troops from Syria. In his letter, in which he did not mention Trump by name, Mattis outlined sharp differences between his views and those of the president, notably on the importance of allies and the use of U.S. power. FILE - President Donald Trump gets a briefing from his senior military leaders, including then-Defense Secretary James Mattis, at left, in the Cabinet Room at the White House, Oct. 23, 2018. "We must be resolute and unambiguous in our approach to those countries whose strategic interests are increasingly in tension with ours," Mattis wrote, warning that Russia and China in particular "want to shape a world consistent with their authoritarian model gaining veto authority over other nations' economic, diplomatic and security decisions." Mattis said he would stay until the end of February, but on Dec. 23 Trump announced that Patrick Shanahan would become acting defense secretary on Jan. 1, speeding up Mattis' departure. Shanahan had been Mattis' deputy secretary of defense. Pentagon spokeswoman Dana White also resigned, leaving the department at the end of December. "I appreciate the opportunity afforded to me by this administration to serve alongside Secretary Mattis, our service members and all the civilians who support them. It has been my honor and privilege. Stay safe and God bless," White tweeted on Monday, according to a CNN report. On Tuesday, Charles Summers Jr. was named the new Pentagon spokesperson.